Over the past two decades, the world has been living through the most dramatic decline in global poverty ever. Since 2000, while global population has increased by 1.4 billion people, the number of people living in extreme poverty dropped by about 1 billion. This remarkable success has brought a goal long considered a pipedream into view: the end of extreme poverty. Three years ago, governments from around the world committed to eliminate extreme poverty by 2030, as the first of the United Nation’s Sustainable Development Goals (SDG). Based on a simple extrapolation of past progress, this goal seems easily attainable: Currently about 8 percent of the world’s population lives in extreme poverty, and over the last 20 years that figure has been dropping by roughly one percentage point a year. Yet such back-of-the-envelope calculations obscure the fact that the nature of the fight against poverty is quickly changing. Back in 2000, the top 10 countries ranked by the largest populations in extreme poverty—collectively accounting for over three-quarters of global poverty—were China, India, Nigeria, Indonesia, Democratic Republic of the Congo, Bangladesh, Myanmar, Pakistan, Tanzania, and Ethiopia. Between 2000 and 2015, 7 of these 10 countries cut their poverty headcount ratios by at least 70 percent (all but the Democratic Republic of the Congo, Nigeria, and Tanzania). This is what drove the global poverty rate down by a percentage point a year. But as of 2018, many of these countries have already nearly eliminated extreme poverty, and thus have little impact on global aggregate figures. Today, extreme poverty is increasingly concentrated in a set of countries that have achieved only limited development success in recent decades, and whose prospects for rapid growth appear slim. In a new report, we identify the countries least likely to achieve the end of extreme poverty by 2030. We find there are 31 countries that are projected to have poverty headcount ratios of at least 20 percent in 2030. We refer to these places as severely off track countries (SOTCs). Their poverty rates are decreasing very slowly, if at all; we estimate that by 2030, 4 out of 5 people living in extreme poverty will be in these 31 countries. Thus, the advances and setbacks of these countries will determine global success in achieving SDG 1. Note: The 31 severely off track countries are Afghanistan; Angola; Benin; Burundi; Central African Republic; Chad; Democratic Republic of Congo; Equatorial Guinea; Eritrea; Gambia; Guinea-Bissau; Lesotho; Liberia; Madagascar; Malawi; Mali; Mozambique; Niger; Nigeria; North Korea; Papua New Guinea; Republic of Congo; Solomon Islands; Somalia; South Sudan; Swaziland; Timor-Leste; Togo; Yemen; Zambia; and Zimbabwe. How does this new grouping of SOTCs compare to existing lists of fragile states? To be sure, there is considerable overlap: 24 of the 31 SOTCs appear on either or both of the World Bank and Fund for Peace lists of fragile states. Yet, we have expressly avoided focusing on “fragility” as a concept, as the term has multiple and inconsistent meanings in the development community. For some people, fragility is about violence and conflict; for others, it is about government capacity; while for others, it is about places with high political instability and uncertainty, where the risks of a coup are high. Our list of SOTCs is not defined by any such diagnostic of the sources of development challenges, but rather by one specific development outcome: a country’s ability to ensure its population can escape extreme poverty over the medium term. Indeed, as we show, while there are several challenges that are common among many SOTCs, each faces its own particular mix of obstacles and binding constraints to sustainable development. Notably, not all are home to significant conflict, violence, or any imminent threats of political instability; in fact, many have seen little political or economic change in decades. The SOTCs include both “donor darlings”—countries where Western aid agencies are eager to engage—and “donor orphans”—countries largely neglected by the international community. Overall, however, international support to SOTCs has been modest; today less than a quarter of total programmable aid committed by OECD donors is allocated to SOTCs. Given that these countries are the frontline of ending extreme poverty around the world, aid agencies may want to consider reorienting their budgets to focus more directly on SOTCs. One reason aid agencies might be reluctant to focus on SOTCs is a belief that development interventions in these risky environments are simply too difficult to accomplish, and thus that many attempted projects will end in failure. 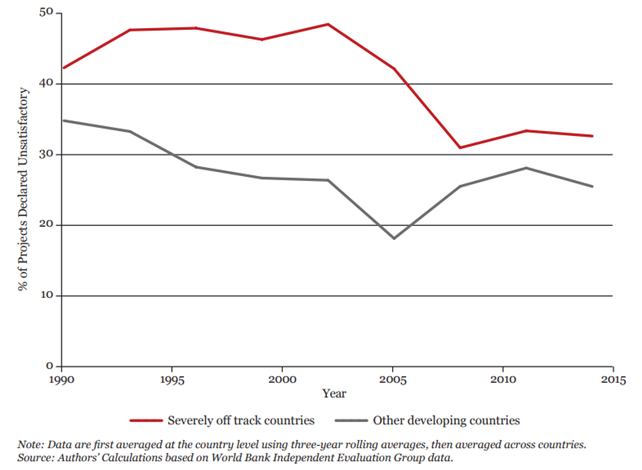 Yet, at least based on available data from World Bank project evaluations, this does not appear to be the case: While a decade ago there was a noticeable gap in the share of projects rated successful between SOTCs and other countries, in recent years that gap has narrowed considerably. Today, on average, development interventions in SOTCs are almost as likely to achieve their stated objectives as projects in other countries. Yet, this does not imply that aid agencies should simply proceed with a business-as-usual approach to their work in SOTCs. While individual projects may be successful in SOTCs, these projects often struggle to have impact at scale. Indeed, the process of scaling up—expanding and replicating successful interventions across space and time—is likely to be particularly difficult in SOTCs. The two most common pathways for scaling up development interventions are through the market or through government bureaucracies. In SOTCs, however, neither the market nor the bureaucracy are reliable pathways. Private markets are often shallow and inefficient, and government bureaucracies are under-skilled and ineffective. Identifying new strategies to move from successful individual projects to transformative countrywide progress in SOTCs is arguably the most important question in development today. While the scale of challenges facing SOTCs is daunting, history also shows us that progress is possible. Indeed, if we had set about identifying a list of severely off track countries 20 years ago, it likely would have included two countries that have achieved dramatic successes in recent years, Laos and Rwanda. Such experiences demonstrate that countries that are currently off track are able to get back on track, and are not destined to fail. How many countries could end extreme poverty tomorrow?